The Hottest Christmas Cards in Town! Give your friends the flavour of Hastings and St Leonards with a HOT Christmas card from East Sussex. 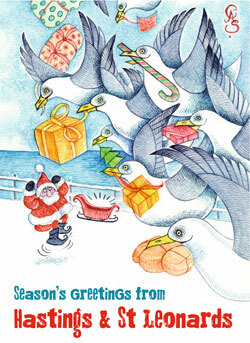 The cards are designed by St Leonards-based artist and illustrator Cathy Simpson. HOT is very lucky to have Cathy on the team, providing us with great graphics and perceptive reviews of local exhibitions. Proceeds from the sale of the cards go towards Hastings Online Times. HOT is a small charity that is run by volunteers. We rely on our readers and advertisers to support the role of citizen journalism in our beloved town. The Christmas cards are £1.50 each or 3 for £4. « Be a HOT Sponsor!